During the last 3 weeks, I’ve been working on the courseware and online lab for the VMware vSphere API training. It’s now available for delivering as private classes, either online or onsite. All the contents in the training will be highly customizable per your project needs in terms of content and time. For example, if you are a networking company, we can put more focuses on the networking aspect of the vSphere APIs. As a former VMware employee who authored the VMware vSphere SDK book with Prentice Hall and created of the de facto open source VI Java API, I can also give you practical advice for your projects. For the public classes, we are still planning it. If you are interested but not enough people (5+) from your company, please leave a comment and preferred time. we will see how we can group multiple groups together for a public class. Should you have a question, please feel free to contact us. (steve _at_ doublecloud.org). I know what you care the most is the content. Here is the course outline. For a PDF version, you can get it here. We understand it would not be fun for an IT training without hands-on labs. That is the something I’ve building and developing. The training lab is now online accessible from anywhere with Internet access. Here is a screen shot that a trainee would see while using her Linux machine. As you can see, the Linux machine is in a browser (either firefox, IE, or Chrome). Every trainee will have her own environment with 4 machines. The technology we have developed can be helpful for other training companies or even companies who want to just show off their products to customers online. Please feel free to contact us if you would like to license it or order the service from the data center by my company. I have a reading your blogs for some time. I am interested in knowing more about this training environment that you have. Is this something you can write about or share? Thx for the interest. What do you want to know about the online training lab? The 4 systems per student in my training lab consist of one desktop VM, two virtual ESXi servers, and one vCenter server. The virtual ESXi hosts use minimum memory of 2GB (version 5.1). Storage wise, it’s 10 GB or so. It’s not enough for production, but for my training lab for API classes, it’s good enough. Together with the system is an automation system so that I can deploy these systems based on the number of students in the training and create URLs to be emailed to each student. All these are done without manual interactions. Hope this helps. BTW, any particular reason you are interested in these? Thanks for the reply Steve. I am planning to setup a dev environment at home to play around with the API and was wondering what kind of hardware I need to get. You probably don’t need the same setting as I have for training lab. My recommendation is to install the free VMware Player and install evaluation versions of virtual ESXi servers and vCenter appliance. Good luck! Would you have training using C#libraries too? The training uses Java for lab. The concept and object model are independent of Java and applicable for other bindings too. I’m interested in the training. Is it still being offered? My preferred lanaguage is Python. I see that there is a Python implementation as well from VMware called pyVmomi https://github.com/vmware/pyvmomi. what’s the difference between vijava and pyvmomi? pyVmomi and viJava are very similar but different implementations in different programming languages: one in Python and the other in Java. The basic concept and object model are the same – we can use pyVmomi for training. Will email you in private. I am interested in API programming especially for custom scripts in vCO. I’ve a query concerning the post, where am i able to get in touch with the author? Saved as a favorite, brilliant website! Thanks Steve! But i don’t have group to go for. Is there any opportunity i can look for to get a seat in other group? I am Mala from Bangalore, India, working for Hewlett Packard. I am learning and development program manager for the HP R&D, India. I am writing this email in context of VMware Vsphere API. we have a need of training in API for our R&D engineers in Banaglore. we are looking for an onsite training. I would like to discuss in detail about this requirement. It would be helpful if I get some contact to whom I could speak, it would be helpful. My coordinates are given below. please do respond. Thanks Mala, I’ve sent you an email. Let’s go from there. Thanks! Steve, would you be interested in coming to Boulder to give some customized training for SolidFire engineering? We’re very heavy into automation and could probably use your expertise to improve our automated testing. Thanks John, I will email you to follow up the training arrangement. I’m curious about the training, but would be interested primarily in rbvmomi, as I’m mostly extending Puppet to manage vSphere. Is that something you might be able to offer? Can we discuss the training further, perhaps via email? I’d like to know about costs, etc. Erm, Steve, not John. Sorry! Hah. Thanks for reaching out. 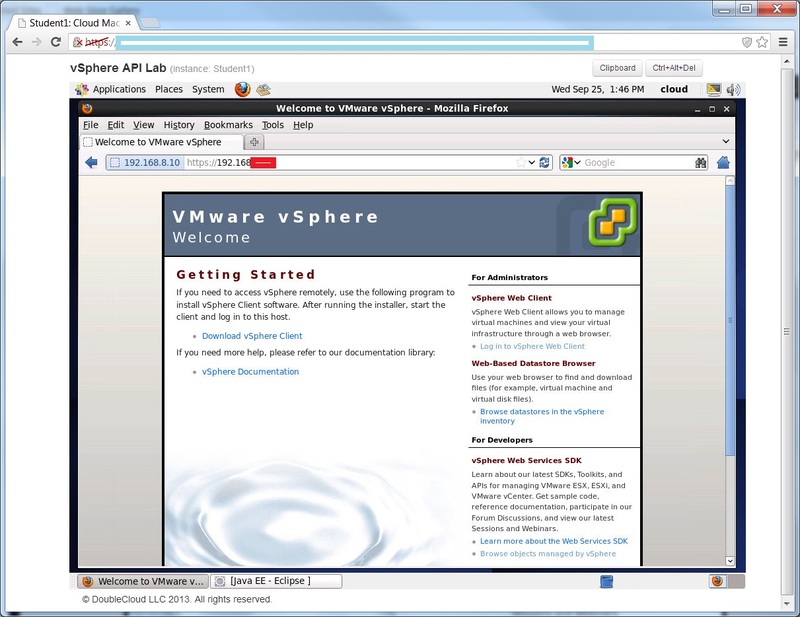 We don’t offer rbvmomi training, but vSphere API which is the fundamental of the rbvmomi. Should you be interested in the vSphere API, we can discuss further. I am interested to learn VMware vSphere API in java or python online and want to know more about this training. Please contact my email ID. Would like more details regarding training on breaking down and dissecting the VMware vSphere API. Hi Steve, I am interested in this training, please let me know about any upcoming course. Is there any training scheduled for the latest versions ? I’m interested as well. Please share the details.